Social media is a vital marketing platform for any business operating today. It doesn’t matter if you’re a new startup or a well-established brand. Social media is where all the action is as far as marketing and user interactions are concerned. When it is used properly, there is no other form of advertising or means of interacting with the customer that is as powerful or productive. However, use social media in the wrong way and you will pay the price for it. There are certain behaviours which are considered red flags on social media. When businesses engage in these practices, it reflects poorly on their reputation and intentions. Make sure that you avoid all of the following at all costs. There are inevitably going to be social media users who head to your business page for the express purpose of causing trouble. Whether these are dissatisfied customers looking to release their vitriol or just your regular garden-variety internet troll, it is vital that you don’t sink to their level. No matter how rude users are to you and your business, you should always remain calm and composed. That’s not to say you can’t fight back - sometimes they set you up for the perfect comeback - but you shouldn’t be resorting to offensive or insulting language. Similarly, sharing humorous images and memes can be a great way of engaging your audience, and maybe even going viral. However, make sure that the humour isn’t controversial or likely to cause offense. Otherwise, you might end up putting people off your business. Even if you agree with the content personally, that doesn’t mean it’s a good idea to associate your business with it. Backlinks through social media shares will count towards your SEO score. Although there is some uncertainty about exactly what impact they have, both Google and Bing have confirmed that these shares play a role in their ranking algorithms. You should consider your SEO whenever you are putting together content to publish on your social media pages. Content that is more likely to be shared is more likely to generate backlinks, which will give your SEO a boost. If you are uncertain about how to fit your social media profiles into your overall SEO strategy, consult with a service like Go Mungo SEO who can help you with the integration. This is a huge red flag for potential customers. If someone makes a negative comment or complaint, and you then delete it, you can be sure they will tell other people about it. Once the word spreads that your business cannot handle basic criticism and feedback, consumers’ trust in you will plummet. Marketing is all about emphasising the best qualities of a product or service, but it should never involve lying about them. When you are promoting your business through social media, ensure that everything you post is true and accurate. Again, your reputation and consumer trust will both take a battering if you are caught lying. When it is used correctly, social media can be a very powerful marketing platform. 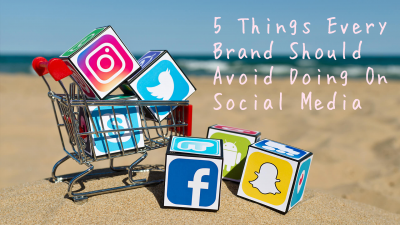 However, when businesses are careless with their social media activities, it can have an equally powerful detrimental effect on the business. Make sure that you avoid any of the above five mistakes as these are the most serious.